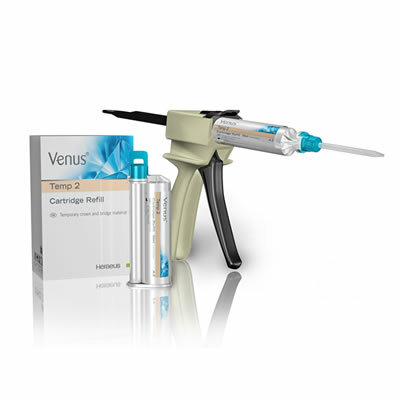 With a unique formula that provides the ideal combination of strength, hardness, and flexibility, Venus Temp 2 offers a perfect temporary restoration that will satisfy both dental professionals and their patients. Nano-particle formula for a brilliant, esthetic gloss finish. Exceptional wear resistance and flexural strength. Optimal flowability for easy handling and application. Available in 5 Vita® shades, perfectly matched to Venus Diamond® Flow flowable composite. Available in the ideal 10:1 ratio of auto-mixed material. Very low oxygen inhibition layer that allows for easier handling and polishing.